Ironically, Bruce Ratner is himself from Ohio; if he tried to pull this crap in his hometown he couldn't do it anymore. 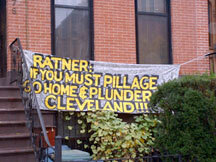 NoLandGrab: Suppose someone should alert the owner of this banner that it is now illegal for Bruce Ratner to "plunder Cleveland," though it is still within the law for Ratner to "go home." A blogger's musings on "friendly :) condemnations:"
Can someone who speaks English, rather than Double Speak, please tell us this: What in the name of God is a "friendly condemnation"? Is it like "friendly fire," which even though it's a big, bad boo-boo, still leaves the recipient as dead as he who is on the recieving end of old-fashioned unfriendly fire? Or is it like what your significant other does when he or she is breaking up with you but still wants to be friends, berating you terribly--but in a very nice way--so that after 12 or so months of weekly therapy sessions you can still be friends? Anyway you cut it, there will be a whole lot of good, old fashioned unfriendly condemnation going on if the project goes forward, and some of these takings of property will become the subject of the litigation that could ultimately determine the project's fate. Daniel Goldstein, who is the most outspoken of the Atlantic Yards opponents whose property would be taken in a most unfriendly way, is deeply convinced that the eminent domain will be the soft underbelly that kills the project. Dope serves up "Superblock a la Mode" to Frank Gehry, inspired by this little tidbit from Slate's review of "Sketches of Frank Gehry." 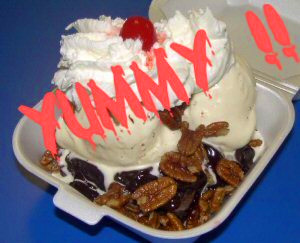 An entire neighborhood of Gaudí—or Gehry—would be like a meal of only ice cream. Too much of a very good thing.